My dachshund has a bump on his lower lip that looks like a blood blister? Could it be something else? If so what? I have a photo that I can send if that would help? Should I take him right away to see his vet or is there something I can try to help clear it up if it is a blood blister and what might have caused it? I have emailed a photo of the bump as well? Thank you in advance for your help in this matter. I won't be able to say for certain what this bump is but I can give you a few ideas. 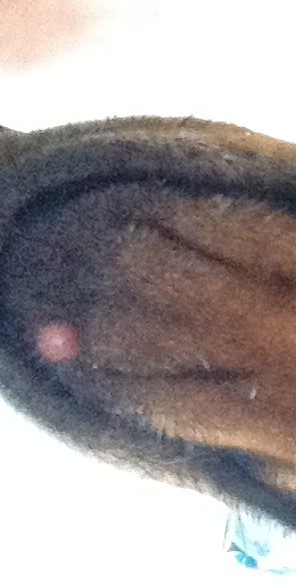 In a young dog, often a smooth pink lump like this can be something called a histiocytoma. A histiocytoma is nothing to worry about and goes away on its own within a few weeks or months. However, something that can look similar to a histiocytoma is a mast cell tumor. Some mast cell tumors are nothing to worry about, but others can be quite serious. The only way to know the difference between a histiocytoma and a mast cell tumor is to have your vet put a small needle into it and draw some cells out to have a look at under the microscope. It's not a painful test at all. There are other possibilities. I have seen some scrapes and small wounds that look like this. However, my best guess is that this will end up being a histiocytoma. It's not something that you need to rush to the vet for right away but it's not a bad idea to have it checked out in the next week just to be sure. Thank you for answering my question and I will get see about getting it checked by his vet. Thank you for the information of what it might be. Just wanted to let you know that I took Snickers to the vet on Friday and had a needle biopsy done on the lump and it is indeed a Histiocytoma and there weren't any cancer cells detected. Thank you again for your adivice. Fantastic. Thank you for letting me know!